A Small Business Innovation Research (SBIR) Phase I was awarded to WideBand Corporation. The Phase I technical objective of this project is research and develop a low latency, multi-node communication architecture based on the concept of WideBand Low Latency Networking, a patented technology invented by WideBand Chairman, Roger Billings and John A. Billings. In the HWIL environment, multi-node connectivity latencies ideally would be at or near zero to prevent the masking of properties of equipment and protocols being tested. While ideal from a theoretical point of view, multi-node zero latency connectivity is not practical. As the performance of equipment and protocols being tested improves, the latency of connectivity begins to mask and, in some cases, even distort test results to the extent that meaningful scientific conclusions regarding the items being tested are difficult to achieve. WideBand Low Latency Networking (WLLN) is applicable to HWIL test environments. Port to port latency of less than 20 nanoseconds is achievable resulting in an order of magnitude improvement over state-of-the-art InfiniBand products. The Army is seeking enabling better testing and cheaper enabling faster response times in military applications. 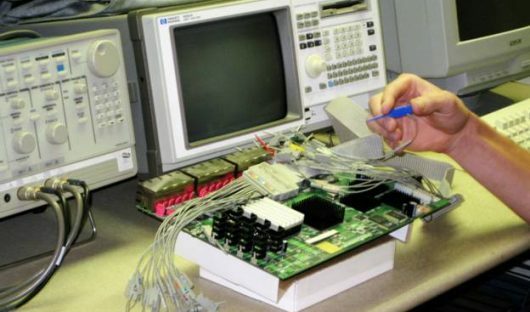 AMRDEC funded WideBand Corporation on the modular, rapid, common Hardware-in-the-loop framework development technology through an SBIR Phase I program. It is anticipated that technology developed in the project will result in concepts and products which will greatly reduce latency in HWIL and other critical environments. The technology proves useful in a wide variety of commercial applications that include cluster computing environments where the very low latency will produce significant improvements in performance of distributed or shared memory systems. WideBand Corporation continues to look for potential customers – specifically targeting organizations that have a strong need for improved communications, switches, network architecture, high bandwidth, low latency, and nano latency. WideBand Corporation is the leading US based manufacturer of high performance, low latency network solutions. Nano-latency networking technology is considered to be the next major step in technology that will make a visual impact on network performance. Market segments to be impacted by the new technology include streaming audio/video, situational awareness acquisition and the development of firing solutions. In these time critical applications, delays in data transmission caused by each active network element in the system can result in serious consequences. Nano-latency products promise to make meaningful improvements in performance for these mission critical applications. WideBand Corporation is the industry leader in this new emerging technology with two foundation patents and a series of high performance products already commercially developed. WideBand Corporation specializes in solving tough networking problems with customized hardware solutions, providing reliable, supportable platforms for mission critical applications. WideBand Low Latency Networking (WLLN) is setting a new standard in Nano-latency data communications and enabling response times heretofore unprecedented in the industry. Customers include the Fortune 500, the US Military, Universities, and many others. WideBand is a registered trademark of WideBand Corporation. All other company and product names may be trademarks of the respective companies with which they are associated.